The Default Cursor color picker selects what color will be used for the sculpting brush cursor. Click the button to select the color. The Shift Cursor color picker selects what color will be used for the sculpting brush cursor when Shift is held. Click the button to select the color. The Ctrl Cursor color picker selects what color will be used for the sculpting brush cursor when Ctrl is held. Click the button to select the color. The CtrlShift Cursor color picker selects what color will be used for the sculpting brush cursor when Ctrl+Shift are held. Click the button to select the color. 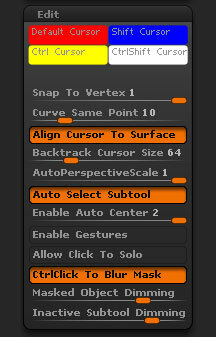 The Snap To Vertex slider controls the distance the cursor will need to be away from a vertex (or point) in order to snap to it. Higher values are further away. When Align Cursor to Surface button is on the sculpting brush cursor will follow the surface of the mesh. The Backtrack Cursor Size slider controls the size the cursor will be on the surface when using the Backtrack Line, Spline and Path options. With Auto Select Subtool on, it is possible to select any subtool on the canvas by Alt+clicking. The Enable Auto Center slider controls what key combination will frame a Tool in Edit mode in the document window. To frame the tool, hold the key combination and click onm the document background. To set behaviour for framing the selected subtool: 0 = off; 1 = Alt+click; 2 = Shift+Alt+click. Option 2 (Shift+Alt+click) is the default. The Enable Gestures switch will turn on the gesture navigation feature. By holding the Shift key while hovering your pen over the tablet, then moving back and forth, ZBrush will zoom into the area that your pen is travelling across. To zoom back out, hold the Shift key and hover over your tablet with the pen while making circles. The Allow Click To Solo button will activate/deactivate Solo mode when the Left Mouse button is clicked on the document background. When the CtrlClick To Blur Mask button is turned on, Ctrl+clicking on a mask will blur the mask edges. The amount of blurring can be set in the Preferences>Transpose>Mask Blur Strength slider. The Masked Object Dimming slider controls the intensity of masks on the tool. Higher values will make the masks appear darker. This is a display effect and does not change the masks themselves. The Inactive Subtool Dimming slider controls the shading value of the inactive subtool’s materials. If this is set to .9 then the inactive Subtool material will have a greater intensity and a lower value will tend towards black. Filling a subtool with color, or displaying a texture map on a subtool, will disable this effect.